I was going to write a lengthy post about the MUD’s decision to anoint a bunch of incompetent, nepotist hacks as their candidates for important posts. I thought about discussing the short-sighted wisdom of shielding important opposition states from genuine competition. 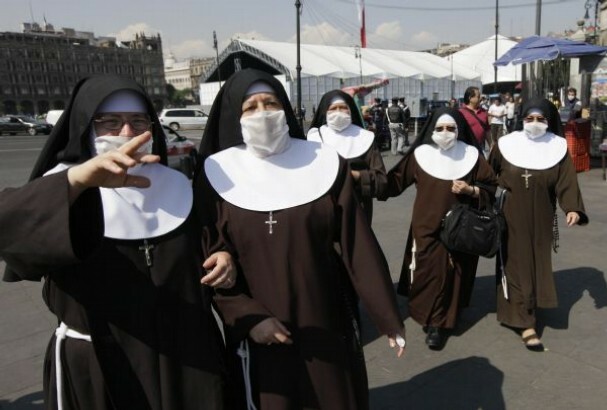 The term I keep hearing is “surgical mask.” Whether it’s in Maracaibo or Valencia, a lot of people are saying that the MUD’s smoke-filled shenanigans are forcing us to vote for people we don’t really like. Certain incumbents are given preferential treatment, we follow along as sheep, and vote while covering our noses. The MUD obviously thinks avoiding the hassle of a primary outweighs any cost from alienating a portion of its base. But are they right? This brought me back to a post Guido wrote a few weeks ago and was sitting in my Inbox. I finally decided to edit and post it, because it says what many are thinking. One of my perennial frustrations with most Venezuelan opposition politicians is that they act as if they had learned nothing from the last 12 years. Of course, there are some new people that seem different and apparently got the memo. But they are a sad minority. Most of our local politicians, the ones on our side, are still hopelessly trapped in a political model that brought us a lot of woe and provides dim hope for the future. Three months ago I was traveling from Trujillo to Mérida with a close friend. We drove up the Trasandina road (in terrible disrepair, I’m afraid), and stopped for a cup of coffee and some cake at the little restaurant in the Pico El Águila, the highest point of the Trasandina. As I entered and tried to recover from the lack of oxygen, I noticed a group of loud people surrounding someone. Everybody was young, pretty and cheerful. I ignored the group and went to get my coffee. “Did you see the mayor?” said my friend. I hadn’t. The person in the middle of the ruckus was the mayor of Mérida, Dr. Léster Rodriguez, former President of my university, and an old copeyano hand. This man is a very incompetent mayor, more interested in promoting his campaign to be governor of the state now that William Dávila is out of the way than in making Mérida a better town. Streets in my city lie covered in trash. Bad traffic management systems and police in weird places rather than in crime-prone areas have all been “achievements” of Lester’s administration. Sure, the Chavista mayor wasn’t any better, but people like Lester make it hard to argue that the Opposition means change and improvement for people’s well-being. I have a very big mouth, and I actually enjoy telling people in power, in the rare occasions that I encounter them, exactly what I think. I honestly believe that people in power need to be confronted with their flaws in governing so that democracy can function. Sadly, most people just smile and bow as politicians surround themselves with chirpy sycophants. Lester wasn’t happy. It seems he is not used to those types of questions. He flatly denied that there were posters with his face in town, and one of his boot-lickers nodded in approval. I then “reminded” him of the poster with his face at the Mérida bus terminal and the whole street lane closed by barriers with his mug on it. His response? Well, it’s much less than what Chavistas do. That was his lame excuse. Like a fifth-grader caught with a chuleta, his argument is simply that the other guys do it, and they do it more often. I’m sure I will. We are hostages of these petty men and women, expecting our obedience and gratitude because they keep the chavista monster at bay, even if they are similar in their self-service and arrogance. I am not sure if I will see his smirk on the ballot. I might not return to Mérida by 2012, or I might be there working. But if I am there, I guess I will be taking my surgical mask to the polling station yet another time. Until I get tired of doing so, and stay home altogether.